Maybe Sammy, the first cocktail bar from the owners of Maybe Frank, has opened at 111 Harrington Street in The Rocks. With the collective experience of an award-winning bartending team hand-selected from some of the best bars in the world, the level of service you’d expect from a high-end hotel bar, an interior influenced by 1950s Hollywood and Vegas glamour and a cocktail list that oozes elegance, Maybe Sammy is here and he’s ready to play. Maybe Sammy is co-owned by Maybe Frank founders Stefano Catino and Vince Lombardo, as well as Maybe Frank’s Creative Director, Andrea Gualdi. It’s Gualdi who has taken the lead on the Maybe Sammy cocktail list, with support from a highly accomplished team including Martin Hudak and Balazs Molnar. Gualdi won Australian Bartender of the Year in the 2017 Diageo World Class competition and placed in the global top 4 the same year and has previously worked at Palmer & Co. Hudak comes from one the most iconic hotel cocktail bars in the world, American Bar at The Savoy (London) and joins Maybe Sammy as 2017 World Coffee in Good Spirits Champion. Coffee is a priority at Maybe Sammy and Hudak has assembled a punchy coffee menu incorporating beans sourced for the venue from Costa Rica and roasted by the team. He’s also created a selection of coffee cocktails including Sammy Shakerato (single shot Ethiopian Kochere Natural, Campari, Limoncello – $19), Espresso Martiki (Nitro espresso, Plantation pineapple rum, Mr Black, mango, banana – $19) and an Irish Coffee (Redbreast 12yo Irish whiskey, Costa Rica Azul Natural, honey, sugar, cream – $19). 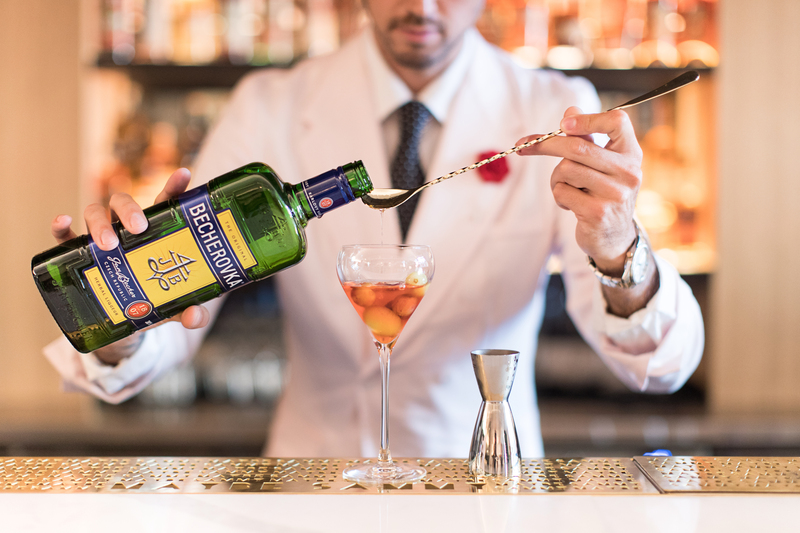 Eight signature cocktails lead the main drinks list, all a modern interpretation of a classic cocktail delivered with a theatrical flair. Each has been named after some of the Rat Pack’s favourite haunts including the showstopper Circus Circus, complete with magic trick (Bulleit Rye whiskey, Martini Ambrato vermouth, mint, poblano – $23), Lady Luck which is presented with a luxurious house-made scented hand cream to give you a sensory experience as you drink (Ketel One vodka, mango, passionfruit, lemon – $19) and Thunderbird featuring house-made jasmine kombucha (Aperol, Americano Cocchi wine, Becherovka, jasmine kombucha, grape rocks – $19). Vintage champagnes make their mark on the wine list alongside an international assortment of wines. The beers are an all-Australian line-up and are available on tap and in a bottle, and there’s also a healthy selection of spirits to choose from. 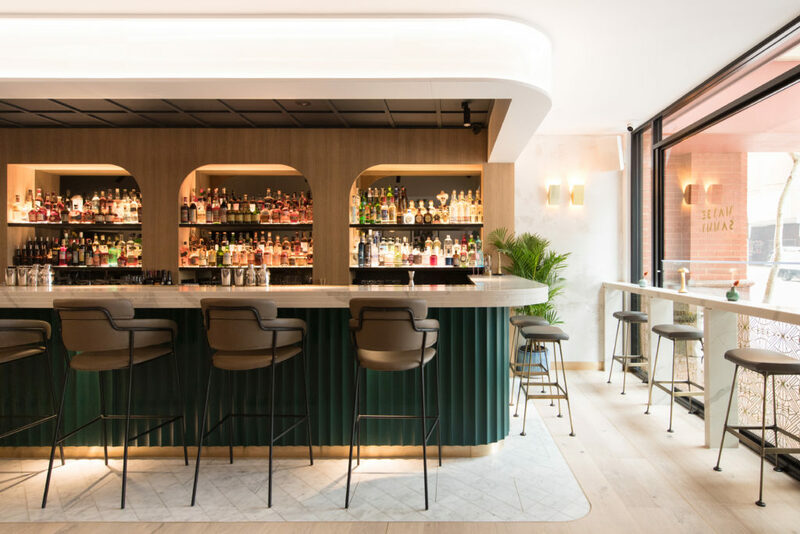 The bar food menu will incorporate several small snacks such as olives, oysters, charcuterie and cheese boards, and has been designed by Maybe Frank chefs Alessandro Leveratto and Stefano Sepe. The Hollywood Regency-meets-Palm Springs design of the venue is reflective of a glam 1950s bar; think classic elegance with a splash of extravagance. LD Studio led by Joseph Lombardo (co-owner Vince Lombardo’s brother) has designed a space that oozes drama and class. Bold lighting enhances pink and green velvet on the walls, smoked mirrors, brass fittings and marble tiles catch the eye, while indoor trees and pink tropical wallpaper remind you, you’re here to have fun. The venue has a capacity of 70 with seating split between pink velvet banquets and leather-clad seats and high stools. Marble tables with gold trim are spaced throughout the venue but it’s the striking marble bar wrapped in a deep green curved cladding and topped with gold lamps that takes centre stage. It runs the length of the venue and is connected by a 16-metre “lightbox” bulkhead to a smaller bar which will be used for food, special events and the occasional DJ.